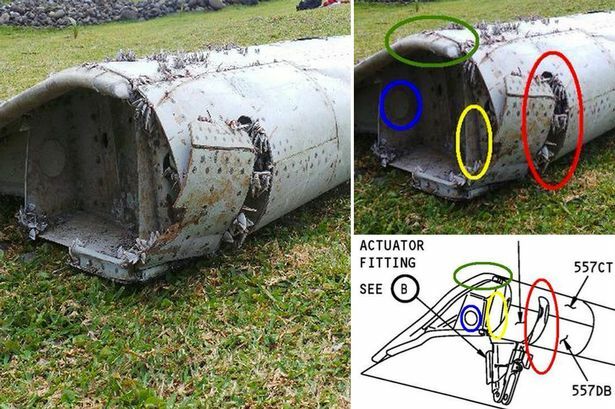 PLANE wreckage discovered off the coast of the African island of Reunion could be from missing flight MH370, according to reports. The debris, which resembles that of the airframe of the Boeing 777 jet, is being inspected by investigators. The plane is thought to have come down in the Indian Ocean on March 8 last year when flying between Malaysian capital Kuala Lumpur and Beijing, China. There were 239 passengers and crew – most of whom were from China – on board when it disappeared. MH370 vanished from radar screens shortly after taking off from Kuala Lumpur. Malaysia has officially declared the disappearance of the flight an accident and has said all 239 passengers and crew on board are presumed dead. An international search operation in the Indian Ocean has yet to find any trace of the missing plane. There have been several theories as to what might have happened to the aircraft after it disappeared from radar. It went north heading towards ­Kazakhstan. Thai military radar seems to confirm the plane turned west, then north. It went west and was flown to Diego Garcia, the British-owned island in the Indian Ocean that is let as a military base to America. Surrounding islanders claim they saw a plane low in the sky the morning Flight MH370 went missing. It went south over the ocean off Australia, where the search has been concentrated. Reunion is a territory of France in the Indian Ocean, several thousand miles from the international search zone.